Perfectly display your existing Jackite kite on this Jackite Green Fiberglass Telescoping Kite Pole. This durable pole easily showcases your existing kite, and can extend to 31' for plenty of drama. The green body meshes with the outdoors, and the base of this item may be attached to a vertical post or pole using twine, rope, or bungee cord. The ten separate sections extend to a generous, 31' height, and the segments twist to tighten without requiring any hardware. The pole collapses to 45.5" for easy storage and transportation, and its fiberglass construction ensures durability. Two metal winder clips rest on one side of the pole, handily accommodating your existing line rigging (not included). 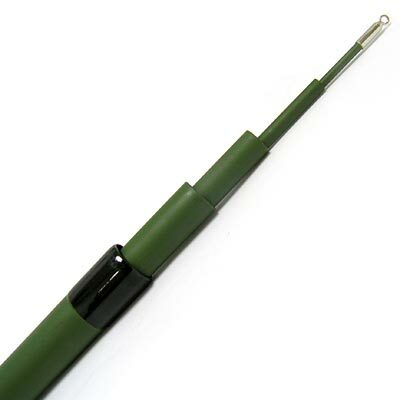 Easily fly your existing Jackite kite on this Green Fiberglass Telescoping Kite Pole. Ninety day limited warranty.